In the final decade of the 19th century, it would have been inconceivable that the cramped commuter shuttle newly trundling through Southwark would one day become the backbone of London’s most crucial northerly conduit. 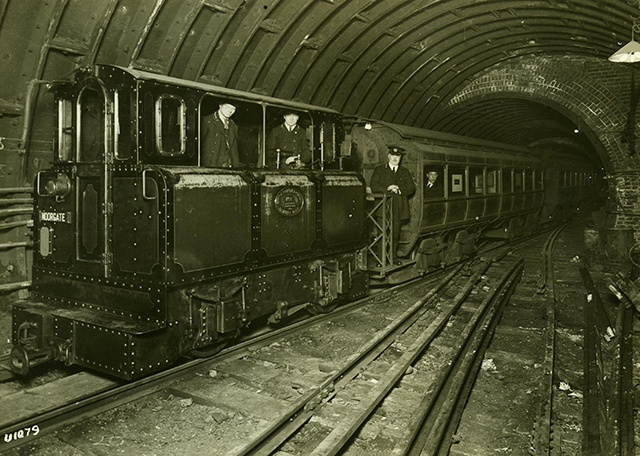 As well as attaining local significance as the city’s first deep-level tube, the Northern line also claims the honour of being the world’s oldest electric railway system. But to mocking Victorians, it was merely the 'sardine-box railway'. 1890: the future King Edward VII officially opens Stockwell station, the southern terminus of the City & South London Railway. Courtesy of the London Transport Museum. Before the Northern line was the Northern line, it was the snappily-titled City & South London Railway. Formally opened in November 1890 as a short — and, by many accounts, crudely built — linkage between Stockwell and the Monument area, the C&SLR was lined up for an upgrade even before the century was out. Owing to the depth of the Thames, and the torturous street layout of the City, the tracks of the original line had actually been forced to run eastwards into their now-defunct terminus — which was sited at no greater a latitude than King William Street, barely 200 yards above the river. But from 1900, the improved C&SLR was forging a new route — along what is arguably the line’s most hellish section for the modern passenger. Now accommodating London Bridge, services headed for Bank and Moorgate. 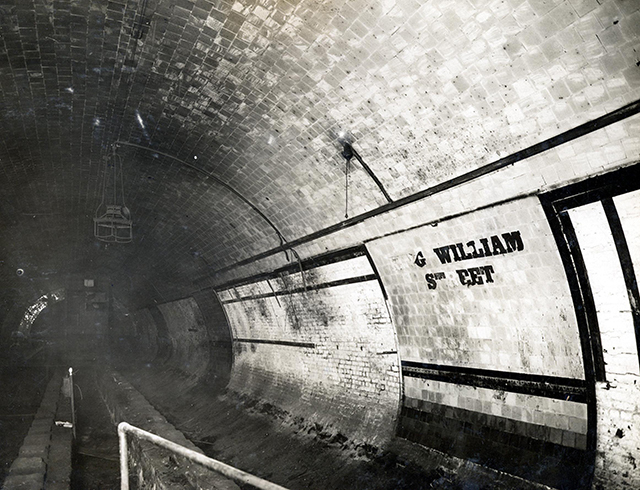 The redundant King William Street station was closed, demolished, lost — although the original tunnels which run beneath Borough High Street were requisitioned for air-raid shelters in the Second World War and remain to this day; ventilating the new infrastructure dug beneath them, as well as playing host to subterranean explorers. The Bank branch of today’s Northern line was soon established in full. A couple of extensions meant the C&SLR could whizz from Clapham to Euston, via such stations as City Road — a stop-off for which many Islingtonians would have great use nowadays, if only it hadn’t been closed in 1922. 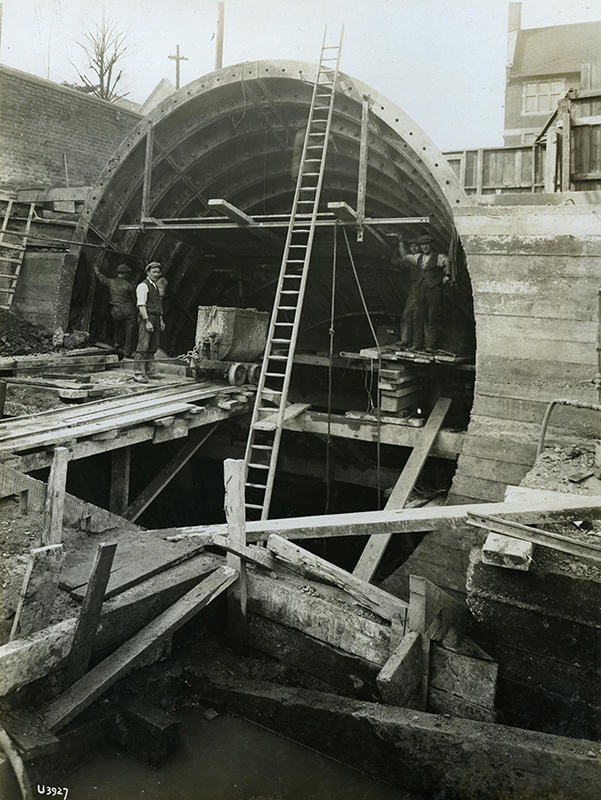 Construction of Tooting Broadway station in 1926 shows the scale of the job of building a deep-level railway. Courtesy of the London Transport Museum. 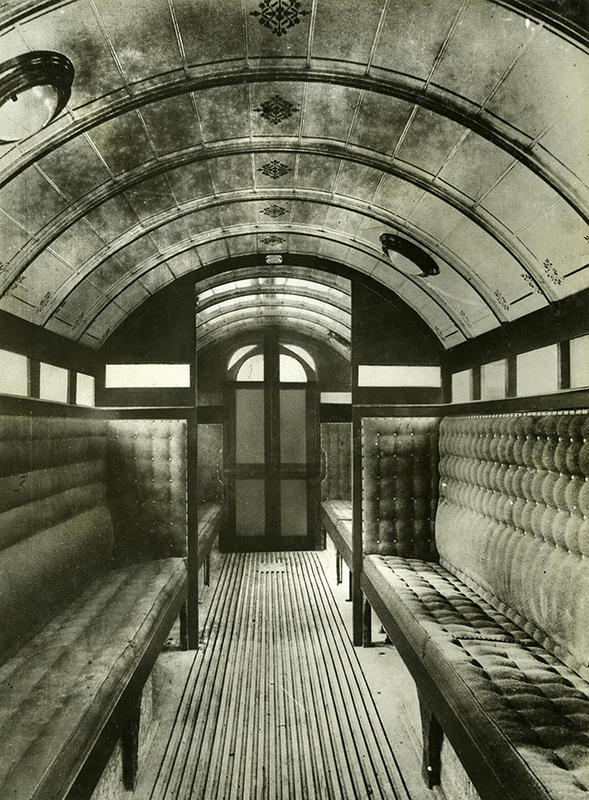 On the City & South London Railway in 1890, windows were deemed unnecessary; the train carriages were nicknamed "padded cells". Courtesy of the London Transport Museum. A City & South London Railway service heads northbound at Borough Junction, 1922. Courtesy of the London Transport Museum. Formerly the northern terminus of the City & South London Railway, King William Street station had been long abandoned by the time this photo was taken in 1930. Courtesy of the London Transport Museum. 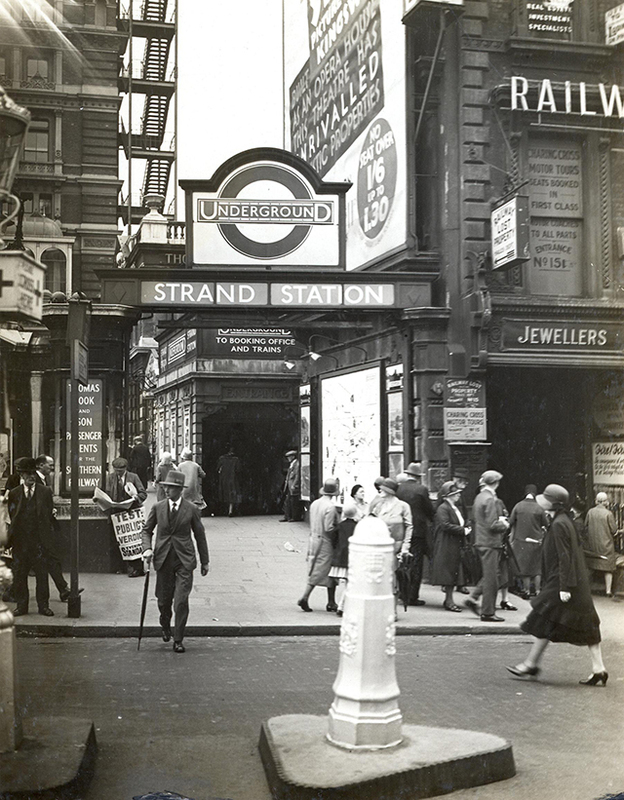 1930: a former entrance located on Craven Street to Charing Cross underground - or, as it was then, known, Strand. Courtesy of the London Transport Museum. Old Street station in 1929. These buildings were demolished in the 1960s. Courtesy of the London Transport Museum. The original Angel station in the 1920s. This building still stands, even though Angel's street entrance was moved to Upper Street in 1992 to accommodate new (very long) escalators. Courtesy of the London Transport Museum. Passengers board a train at Archway in 1907 -- or as it was then, known, Highgate. Photo courtesy of the London Transport Museum. 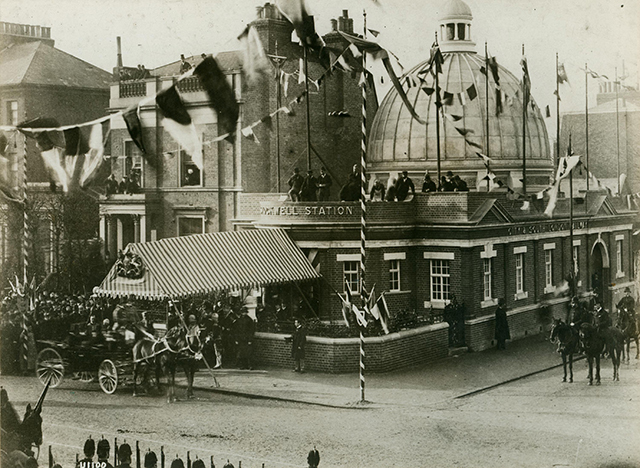 South Kentish Town station, 1907. It would close in 1924. Courtesy of London Transport Museum. It was at this point that the Charing Cross branch began in earnest. 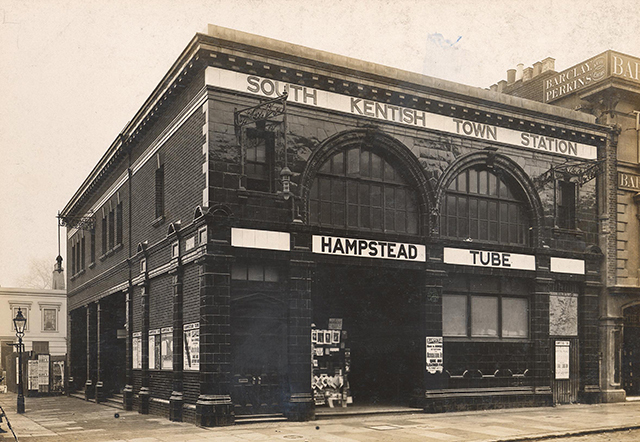 Severely held up by funding problems, it finally opened in 1907 as the Charing Cross, Euston & Hampstead Railway. The CCE&HR snaked from Golders Green and from Highgate (then the name for Archway station) down to Charing Cross, with an easy extension then linking it with the relative hub that was Embankment. Understanding the modern complexities of the Northern line — its multiple termini; its tourist-baffling double-branch system — is partly about understanding the piecemeal fashion in which the tube network developed, under the initiatives of competing companies. The CCE&HR was managed by the Underground Electric Railways Company of London. That firm had monitored the successes of both the C&SLR, and the older, steam-powered lines like the Metropolitan — which had by now been running for half a century. 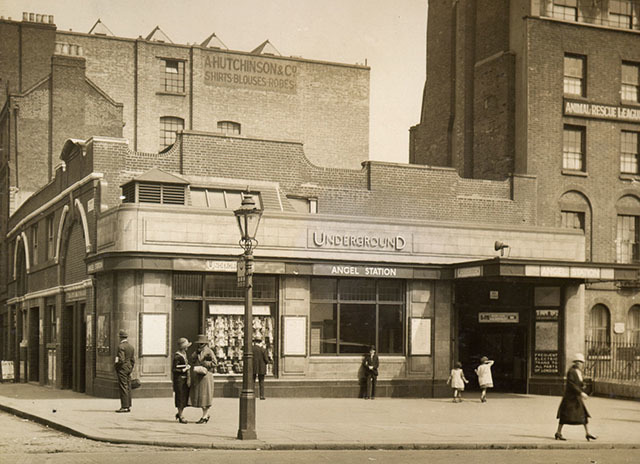 Though struggling financially, the Underground was allowed to expand in the years before the First World War — buying up the C&SLR, so owning both the Bank and Charing Cross branches. It would prove a risk worth taking. Put on ice during the war, a plan to integrate the two lines was finally executed in the 1920s — thanks to new tunnels between Camden Town and Euston, and a continuation of the Charing Cross branch to Kennington, via Waterloo. Although arguably the most crucial stage in the evolution of the Northern line, the linkage has become a source of chagrin for modern TfL. City Hall has vainly tried in recent years to divorce the separate branches — in order to relieve a bottleneck at Camden, which would allow more services through central London. The 1920s witnessed still more extensions, to Edgware and Morden. In the spirit of the 'Bakerloo' portmanteau, names like “Mordenware” and “Medgway” were proposed, before the line’s “Northern” moniker was selected in 1937. 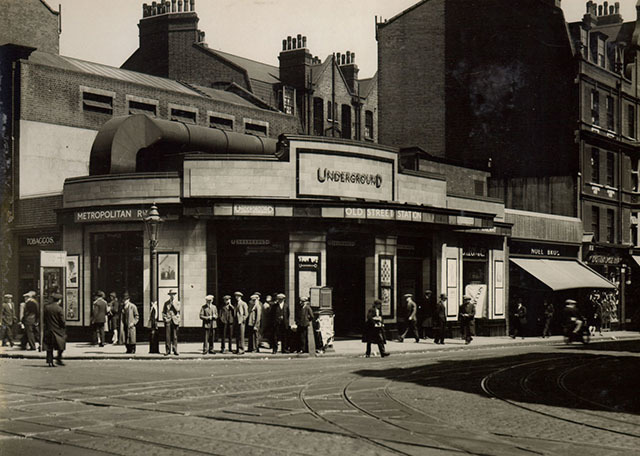 A so-called Highbury branch was acquired in the 1930s, which linked Moorgate to Finsbury Park — and which was originally intended to travel much further north, under the abandoned Northern Heights plan. Until 1975, this spur was considered part of the Northern line despite terminating Moorgate. That same year, those buffers had witnessed the biggest peacetime loss of life on the Underground, when a train hit them at speed and 42 were killed. Over 125 years of service has seen derailments, defective trains, and dodgy breathing conditions for passengers anywhere on the Underground. But when it comes to judging the unparalleled success of this historic system, the figures speak for themselves: with over a quarter of a billion journeys taken every year, through 50 stations (and it’ll be more when the Battersea extension is completed), there’s no stopping the Northern line. Except signalling issues at Mornington Crescent, perhaps. Sitting between Hampstead and Golders Green is a station which began to built but was never opened: the shaft down to the would-be North End station, AKA Bull and Bush, still remains today. Its tunnels house the controls flood-prevention equipment for stations which straddle the Thames. Tottenham Court Road station was named Oxford Street when it opened in 1907. At 60 metres’ length, the escalators at Angel station are the Underground’s longest. 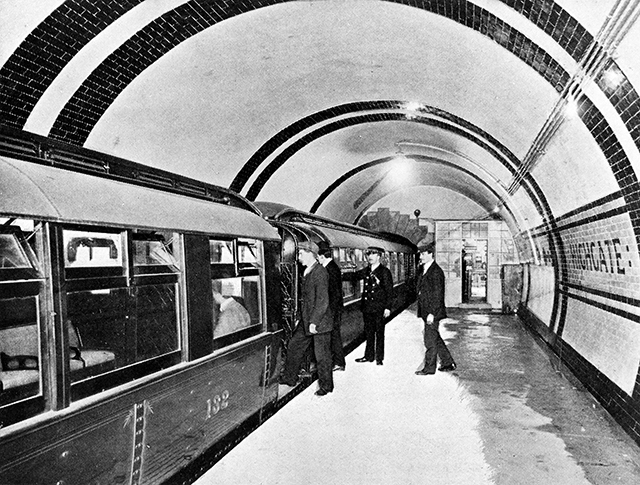 During World War II, air raid shelters were constructed beneath stations on the Charing Cross branch. The idea was ultimately to join these up into a second, “express” Northern line, but the plan was shelved. At Clapham, the tunnels have been used for growing herbs. When the Northern line’s western branch terminated at Charing Cross (or as it was then known, Strand), a reverse loop was built under the Thames to allow trains to curve back round the system. This explains the bend on the northbound platform at Embankment.